Enzymatic Therapy Acidophilus Pearls is a probiotic that is designed to help support digestion and a healthy G I tract. It provides a combination of two different active and live cultures that support the overall health of the intestinal tract. Acidophilus Pearls are manufactored using an advanced encapsulation technique, which results in a product that is stable at room temperature for up to 18 months. The difference between this probiotic and other on the market is their patented True Delivery Technology. The pearl capsules are protected from the harsh stomach acid so they can be released live and intact in the intestines, arriving alive to perform their beneficial functions. Probiotics support digestive, immune, and skin health. Beneficial probiotics can help you get relief from occasional gas, loose stools, constipation, sensitive stomach and lactose intolerance. It ensures your body is not weighed down by toxins which may limit your immune defenses. Probiotics help support healthy skin from the inside out: they help manage and eliminate free radicals and toxins. Why use Acidophilus Pearls ? It's The Smarter Probiotic. 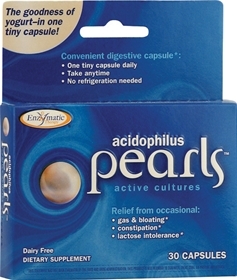 Acidophilus Pearls delivers active cultures where you need them - guaranteed. Notes: If taking prescription drugs, consult your healthcare practitioner prior to use. vegetable oil (palm and coconut), fish gelatin (Tilapia), vegetable glycerin, soy lecithin, and pectin. May contain minimal residual amount of milk protein.